A perspective of MotorCity ... new masterplan. Union Properties (UPP) has revealed a new masterplan for its flagship MotorCity development in Dubai with a completed value of more than Dh8 billion ($2.17 billion). An agreement has also been signed with China State Construction Engineering Corporation (CSCEC) to build the new mega development. 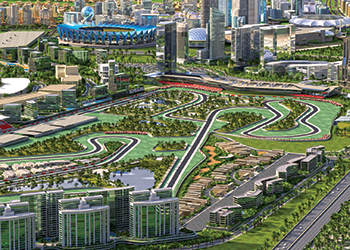 The MotorCity masterplan comprises 44 new high- and low-rise buildings, more than 150 villas, and a wide range of residential, commercial, entertainment and hospitality facilities. It is will house more than 11,500 residential units, 3,000 serviced apartments, 3,500 hotel rooms, and 46,000 sq m of retail space in addition to more than 300,000 sq m of office space. In total, the new masterplan will see construction of around 18,000 units comprising residential apartments and villas, hotel rooms and serviced apartments. At the heart of the new development will be a new design for Union Properties’ ‘Vertex’ - a mixed-use development with five towers that will include a five-star hotel and serviced apartments.